When you want quality in waste bags and plastic garbage bags, think Heritage Bag Company. Heritage is one of the industry leaders in the can liner and food bag industries. With their vast product lines offering environmentally friendly waste disposal products, Heritage paves the way in food bag and can liner innovation. Heritage has been in business for over four decades and the company's commitment to the environment is legendary. Their manufacturing process and products allow them to divert plastics from landfills, use less petroleum based material, reduce energy usage, and reduce greenhouse gases emitted during the manufacturing process. At Heritage, they follow the three R's: Reduce, Reuse and Recycle. 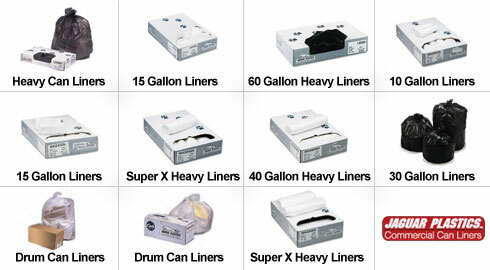 Heritage trash can liners, at ReStockIt.com, are offered in many sizes and duty grades to choose from. Restockit.com carries all the Heritage trash can liners and food bag products you need, including Jaguar Plastics waste bags and food bag items at or below wholesale prices. For all of your plastic garbage bag and food bag needs, Restockit.com is proud to bring you these environmentally friendly products from the Heritage Bag Company.